My Hawaiian name means beautiful song. In the old Hawaiian way, grandparents prophesied the name of a child which came to them in a dream. In my case, I was named Mele Nani, meaning beautiful song. From the time I can remember, making music has been part of my life. My parents started me on piano lessons when I was 7-years-old, and I continued playing all the way through high school and into the Conservatory of Music at the University of Pacific in Stockton, California. My mom used to stand next to the piano and help me keep time to the metronome ticking back and forth. Perhaps this is where I got my sense of rhythm. Growing up in Hawaii, all our family parties were full of singing, playing piano, guitar, and ‘ukulele, and dancing hula. When I was 12-years-old, my Dad managed my cousins and I who performed in a group of five girls ages 5-12 as “Charlie’s Dollies.” We performed at our church and around town. I remember when we performed at the orthopedic ward of the Armed Forces hospital in Honolulu. When we entered the ward, many men had their legs and arms bandaged and hoisted in slings. As we sang and danced for the men, I noticed the faraway look in their eyes, perhaps as they remembered their little sisters back home. That sense of connecting to people through our music touched me; to a point that several years later when I headed to college I wanted to be a music therapist. My Dad instilled in me the love of making music, and making people happy. “Music is the universal language and will open doors for you wherever you go,” he told me. When I came home from college, I helped my Dad play music (he on ‘ukulele and I on guitar) for the Shriners Hospital for Crippled Children. He was active in the Aloha Shriners clown core and music group. My Dad passed away August 14, 2012 at the age of 91, and I still hear him talking to me. As my upcoming 61st birthday on January 29 approaches, my new mission in life has emerged. 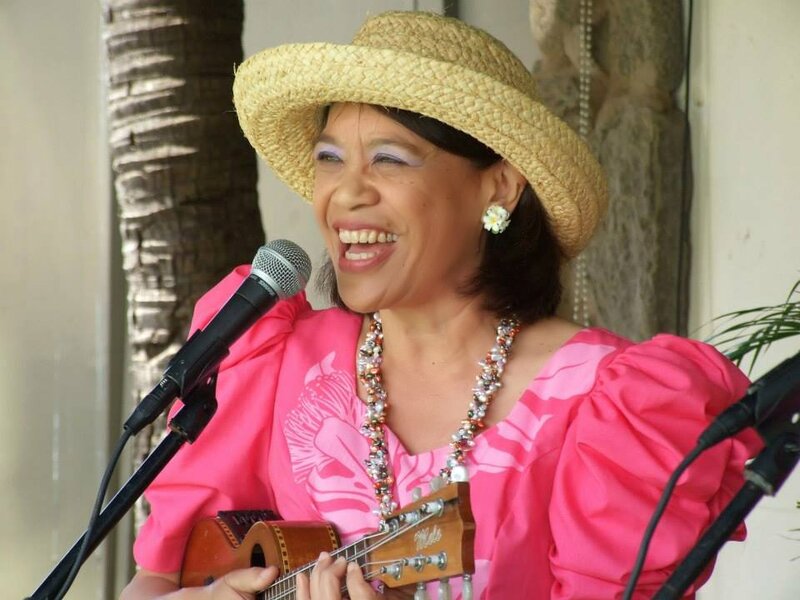 I am all about “sharing the joy of making music, one ‘ukulele player at a time.” My name is Mele, I play the ‘ukulele, and my business name is Ukulele Mele On Maui (where I live). My method is based on the old Hawaiian way of watch, listen, play without reading music sheets. It’s the method I remember growing up in Hawai’i as I played music with my family and friends. And it works. My business Ukulele Mele On Maui began on July 1, 2011 after students taking my ‘ukulele classes at Kaunoa Senior Center for adults 55 and better told me I needed to expand into the virtual classroom. Today, no matter where you live you can learn from me. You can learn online, download single song lessons and learn on Maui. You can also enjoy entertainment by my husband and I performing as the duo, The Hawaiian Serenaders. Now you know the story behind Ukulele Mele. Where else can you learn how to play Hawai’i’s official instrument, the ‘ukulele, from a Native Hawaiian whose name was prophesied Mele Nani, meaning beautiful song? You can learn the Ukulele Mele Way from wherever you live!